Being an early adopter of a console can sometimes be a bit rough when it comes to having good games to play on it. The Nintendo Switch seems to be doing better than most consoles at launch with AAA games like The Legend of Zelda: Breath of the Wild, Mario & Rabbids and Splatoon 2 leading the release window pack. The indie side is also well represented with quality titles being released each week. It is into this arena that Conga Master Party steps. Developed by Undercoders and published by Rising Star Games, Conga Master Party is best described as a variation of the old mobile phone game Snake. Instead of controlling a snake and eating dots to grow, you play as a conga master dancing his way through various stages. 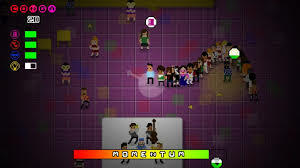 In order to grow your conga line, you need to closely dance around other NPC’s for certain periods of time in order to get them to join your conga line. Every time you gain a new member to your line your momentum (basically the in game timer) increases slightly. 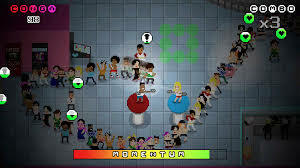 The level ends when your conga line contains the specified number of different types of people or if you run out of momentum and you need to start again. And that’s it. The game is as bonkers as it sounds. It is also, like Snake was, rather addictive. Because the area of each of the characters you need to dance around is rather small, there is some skill involved in successfully building your conga line in the limited time. This combined with the fact that levels do not take too long to complete definitely adds to the “one more go” factor of the game. The music and sound also deserve the bonkers moniker when describing them. Each stage has a specific song that is played during the level. The roller disco stage song in particular has an 80’s electronic feel while the opening stage song seems to be a spoof samba song. The songs in themselves are perfectly suited to each level and are excellent; but it is when your character bursts into the room at the beginning of the stage shouting (in a dodgy accent) “what could possibly go wrong” that adds the cherry on top. There are quite a few modes for you to work through in Conga Master Party. 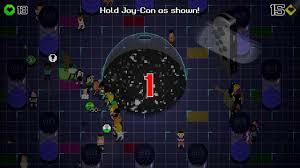 The story mode involves taking your built up conga line from venue to venue (and protecting it from alien invaders!) whilst endless mode is all about how long you can keep the party going. The stages for these modes vary from clubs and roller discos to burger joints and cocktail lounges. All of them are filled with humour and brought to life with the 8-bit graphic style that is reminiscent of the 80’s where the game seems to be set. Not only does the whole thing comes across as tongue firmly in cheek, but there is a decent little game in there to boot. Taking the revised title of the game as a hint, Conga Master Party is pushing the multiplayer modes as a reason to own the game on Nintendo Switch. The first thing to mention about these modes is also my favourite. Each multiplayer mode’s name is a play on other popular video games. The fighting mode of the game where you first amass a conga line of bubbles then attempt pop all of your opponents bubbles first is called Mortal Conga. 1,2 Conga has players engaging in a rock, paper, scissors battle whilst Just Conga has players using the Joycon to strike dance poses. My absolute favourite of the names however has to be Command and Conga. 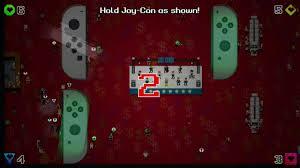 There are a few more multiplayer modes for you to work through but ultimately they all boil down to the same thing – Undercoders have created one of the best local multiplayer experiences currently available on the Nintendo Switch. And as glowing an endorsement as that is there is unfortunately a downside that effects the entire game. Conga Master Party will eventually outstay its welcome. Yes, there are unlockable characters to get in single player and more multiplayer modes than you can shake a maraca at but there is isn’t enough here to warrant you playing it every day. Even in the multiplayer mode, you will find yourself drifting back to meatier multiplayer experiences like Mario Kart. But this is fine – Conga Master Party is fun for the first few days after you get it and will be worth more than the £8 asking price whenever you get your friends around for the unpredictable mayhem that will ensue. And that is possibly the best way to end this review – Your love affair with Conga Master Party may be short lived but, you won’t regret it.